“At lizt twenty-foer heurs” the clerk informed me at the lost baggage desk. Merde! 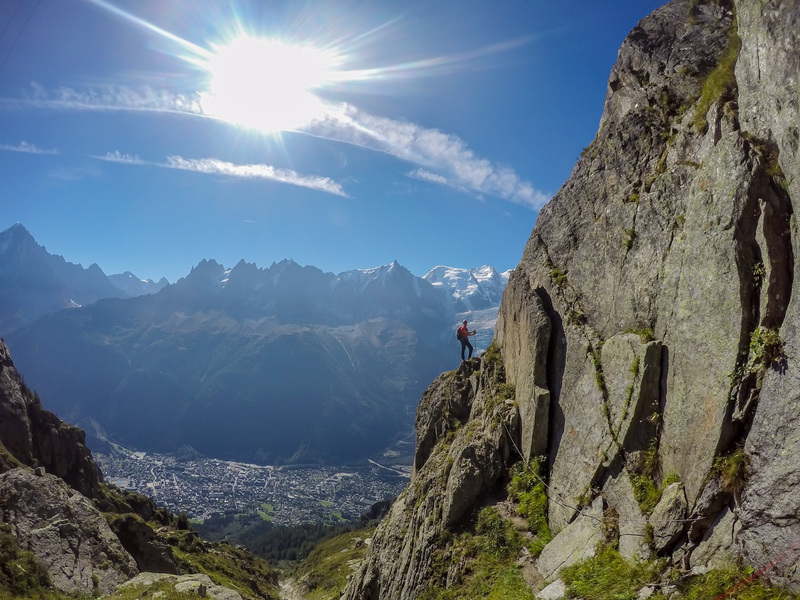 Stunning weather and no climbing gear for our first day in Chamonix then! Combined with a flooded apartment and our transposal to a bedsit, this was not a good omen for the trip ahead. Nevertheless we bundled on the transfer and I set about trying to scrounge some compensation. 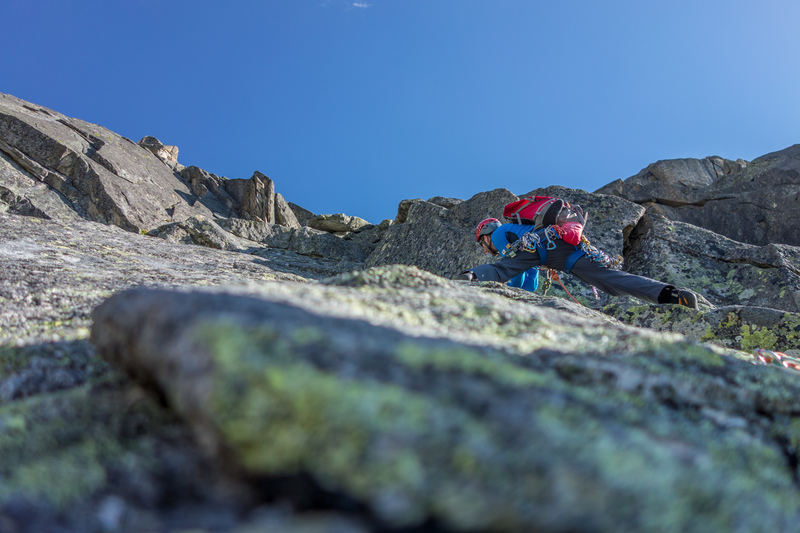 With the promise of a small coin purse of Euros we made for the nearest gear shop next day and procured the bear minimum of gear required for a bolted route. Heading up to Le Brevant, we optimistically backed ourselves for an ascent of Poeme a Lou straight out of the gates. 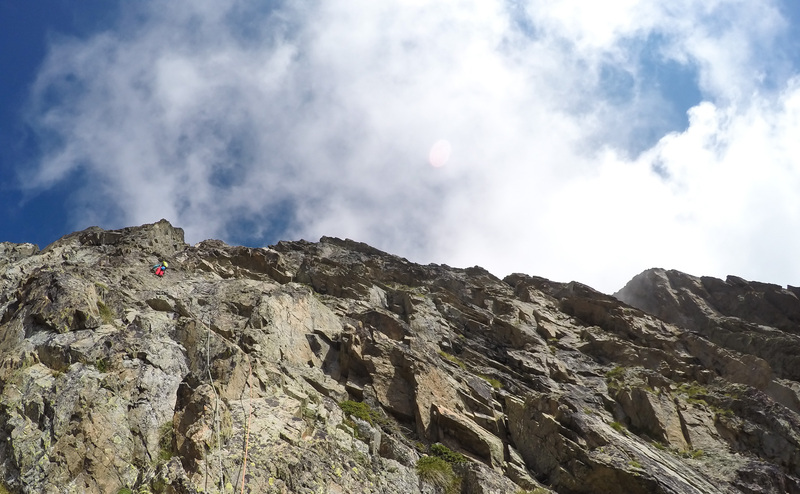 Mark on the approach to Poeme a Lou, complete with handy fixed rope! 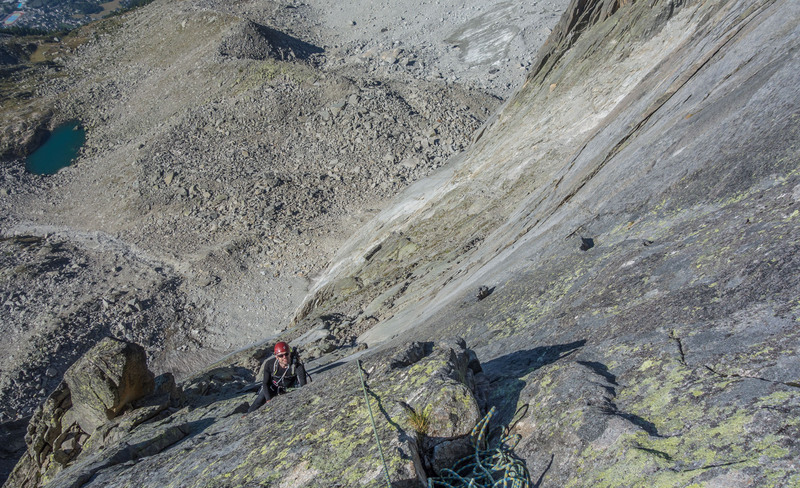 With pitch grades varying quite a bit between guidebooks and our newest select guide down-playing the difficulties, we didn’t fully appreciate the significance of the 6a+ “obligatoire” warning. In the roasting heat things very quickly turned desperate but Debs and Mark did an incredible job leading the first two pitches. 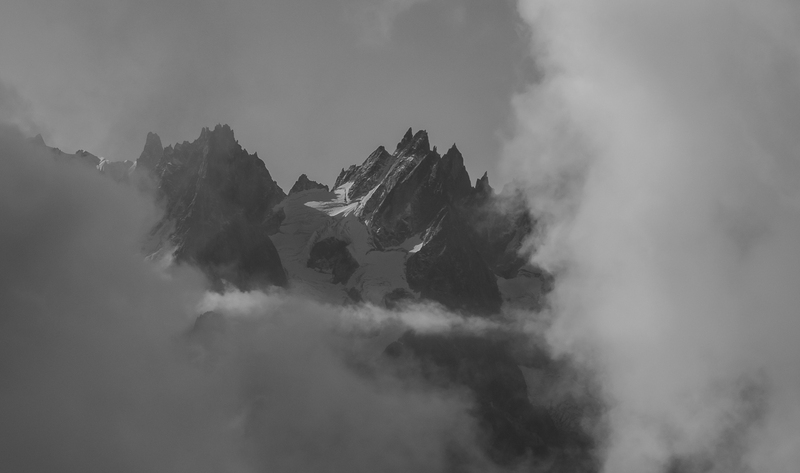 The next day saw us heading up to the Plan de l’Aiguille with intentions on something a little more mellow but no less spectacular. 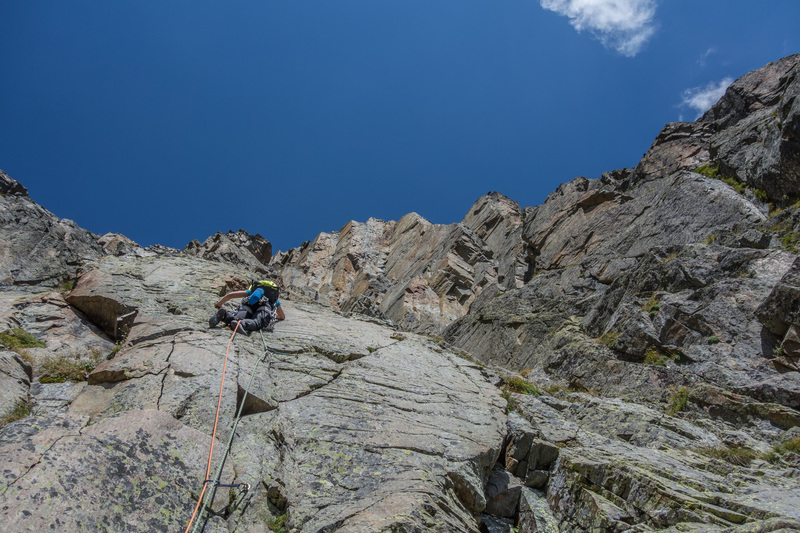 We stashed bivvy gear and soon found ourselves sketching our way to the base of Lepidopteres on the NW Face of the Aiguille du Peigne. 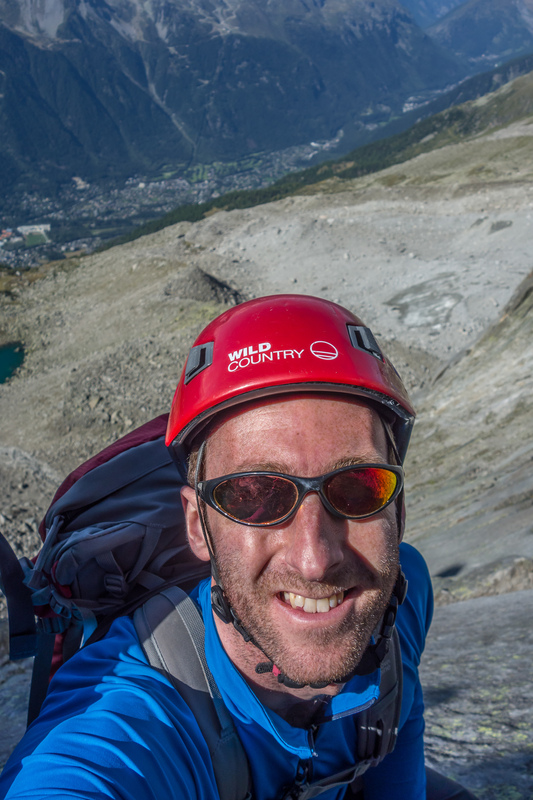 In typical fashion we doubled the guidebook approach time, but I’m glad we took our time on the exposed ledges and finding the start of the route is not trivial! 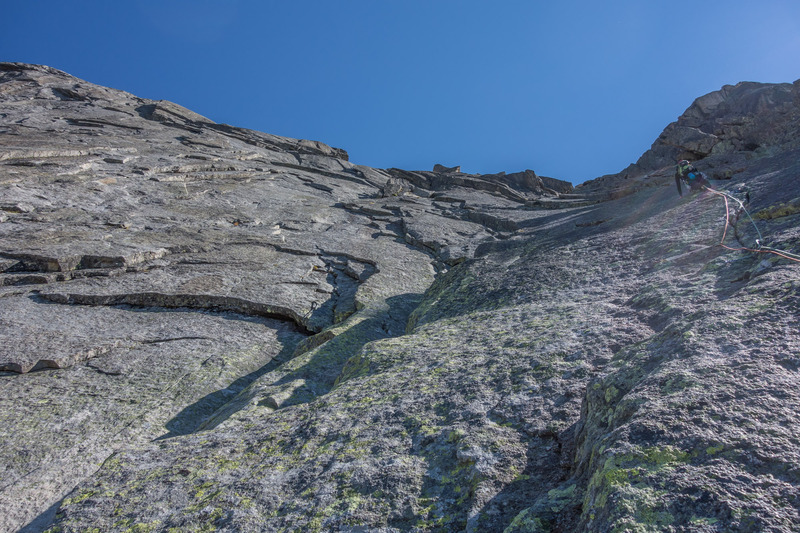 The route follows a continuous cracked slab for five quality pitches to the notch at the end of the Papillons Ridge (directly above the belayers head in the above photo) and descends as for that route down the Papillons Couloir. We all thought the climbing to be of excellent quality, although surprisingly technical for the grade. 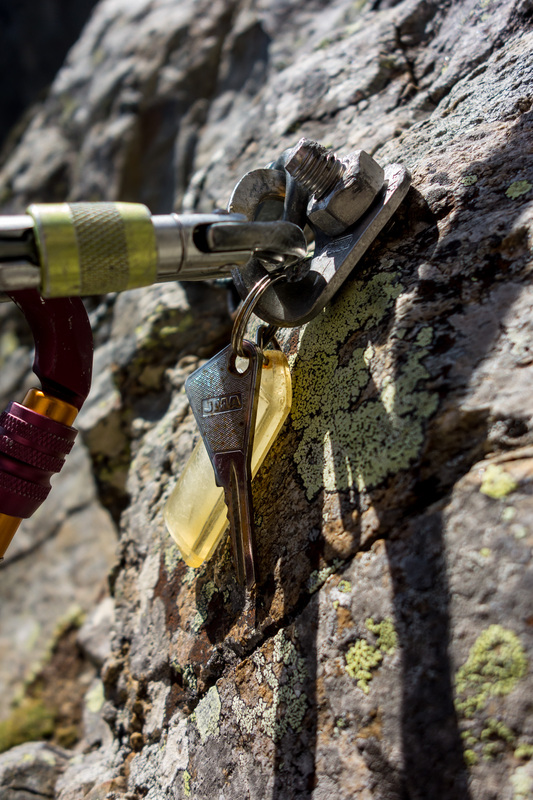 The 5b pitch wouldn’t be out of place on a tough VS in Scotland so I would treat the UKC logbook grade of HS with a bit of caution and go with a grade or two in the bag. 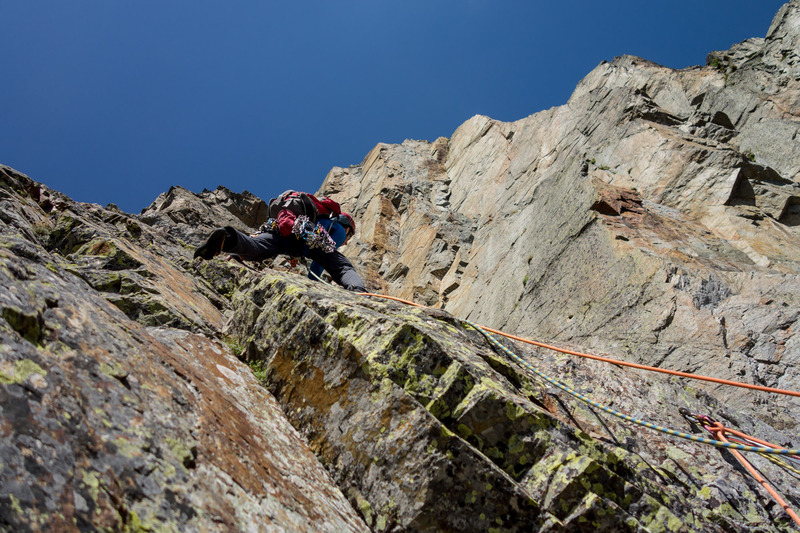 We had decided to bivvy to get an early start the next day and following a night interrupted by the sounds of constant and alarming rockfall we made our over the moraines towards the Red Pillar on the West Face of the Aiguille de Blatiere for a pop at the classic Nabot Leon. 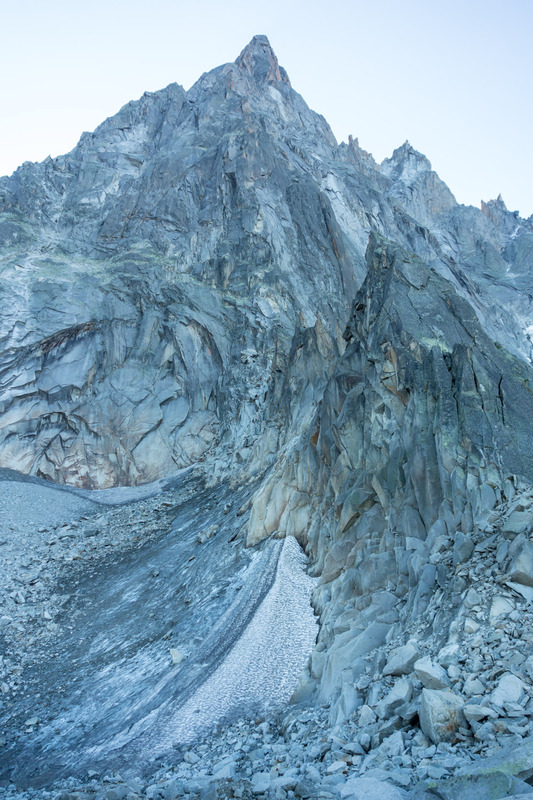 When we got to the top of the moraine and could see the final part of the approach we immediately had doubts. 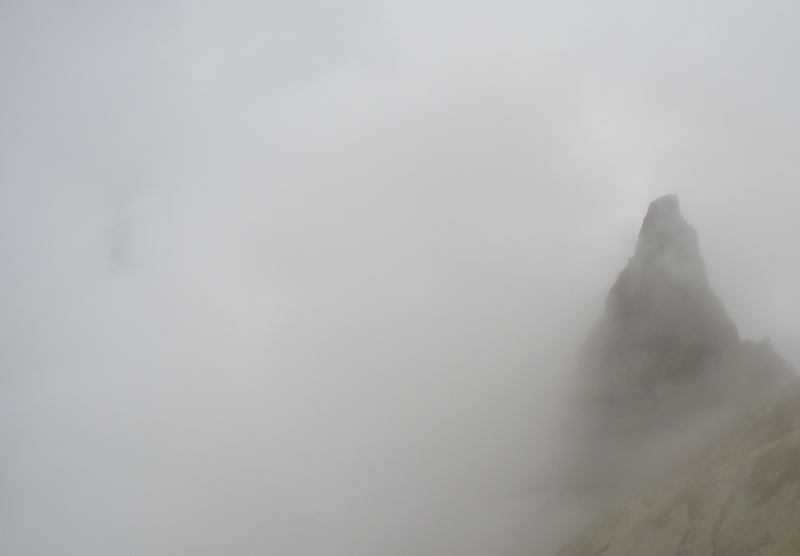 Maybe it was the constant rockfall during the night or the fact that any rocks coming down would be funnelled right on to us, but no one fancied it. 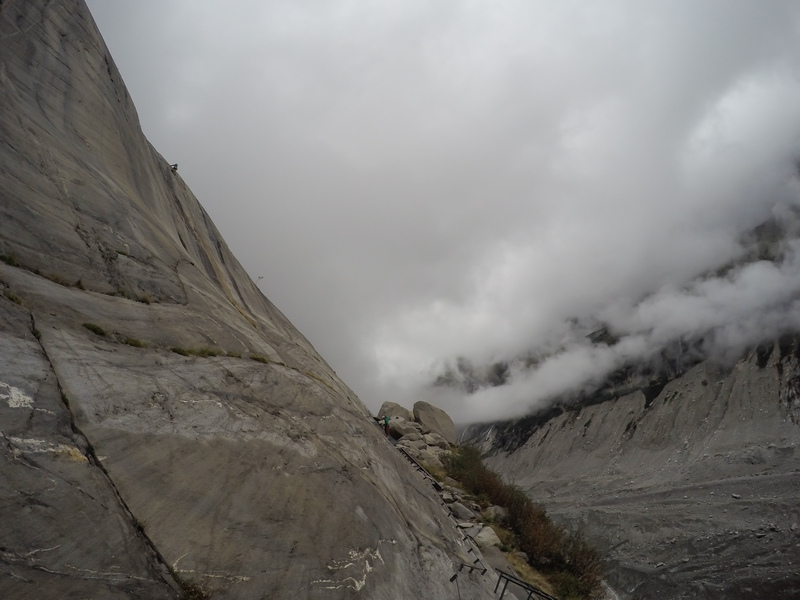 As we stood around deliberating we watched a rockfall tumble into the bowl above us, right where we would have to walk. This sealed the deal. A real shame as the Red Pillar looked fantastic. 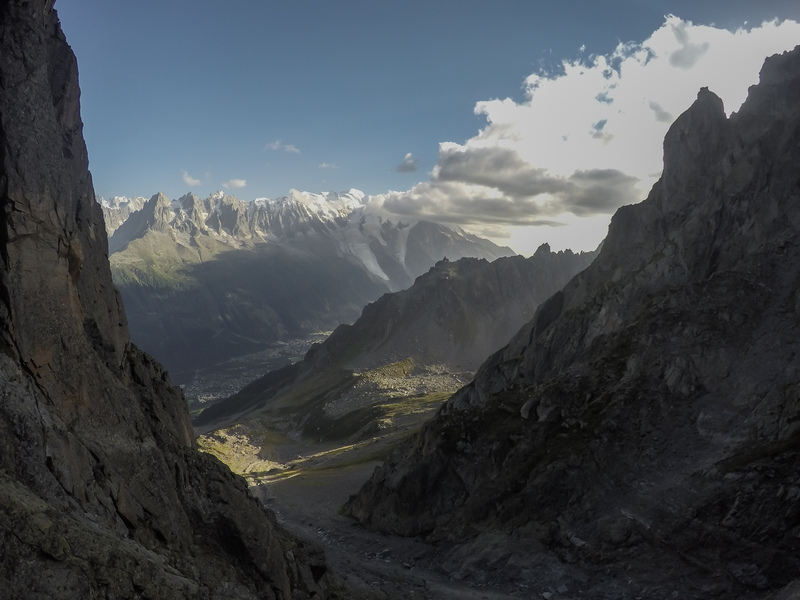 As we turned to walk down we were greeted with hordes of climbers intent on heading up that way. Maybe we’re just too risk-adverse? 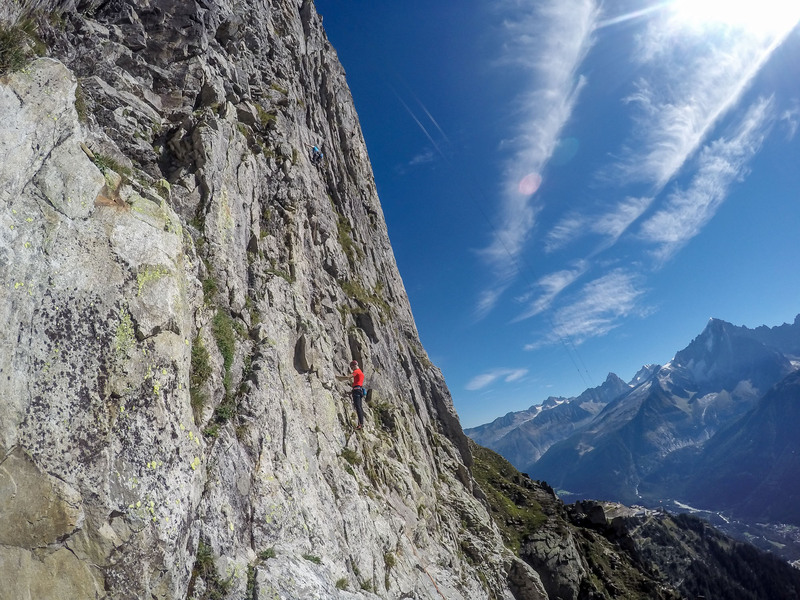 To salvage the day we had a quick turnaround and shot up to the Index for a great looking route on the less-visited West Face called L’an d’Emile. The first few pitches went smoothly and we enjoyed lovely (if sparsely bolted!) 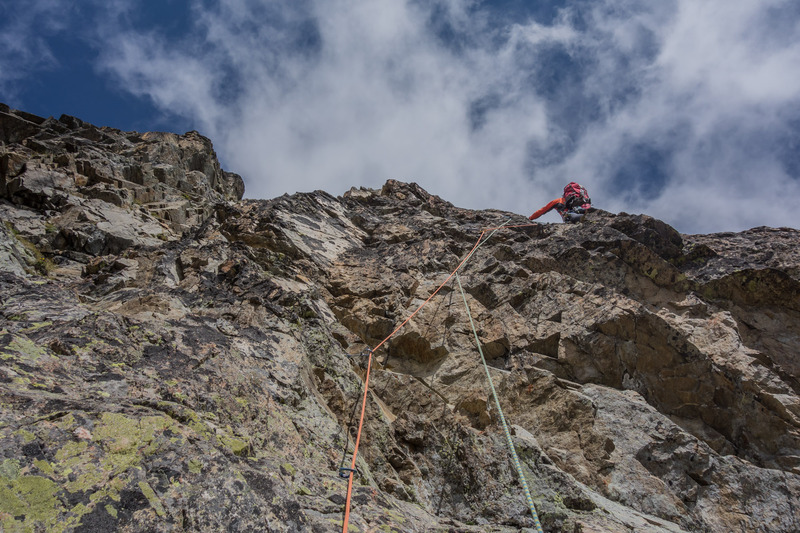 climbing to belay below a dramatic steepening. 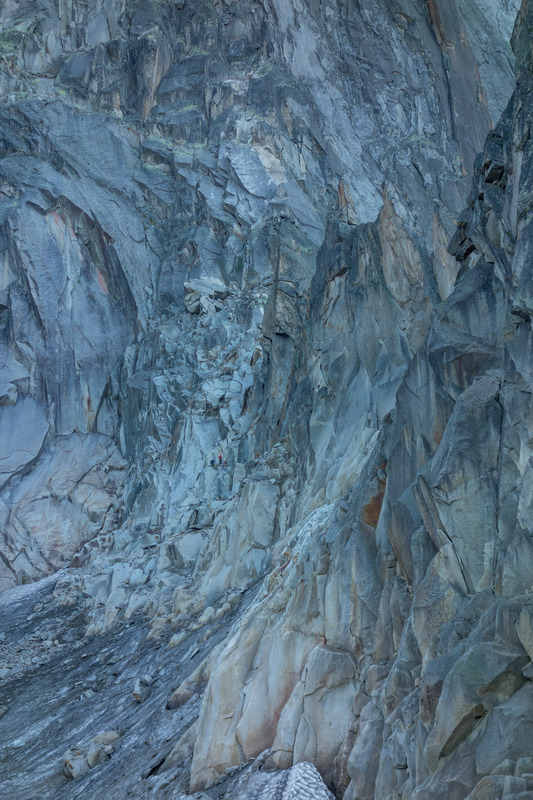 Rope-gun Reid took charge and blasted the overlapping corners to arrive at a loose traverse below the next anchor. In an awkward position so as not to pull on the loose rock, Mark began to transfer his entire body weight on to a high right toe. With a cry of pain shouts of “watch me” and “my knee’s gone” came down to us. 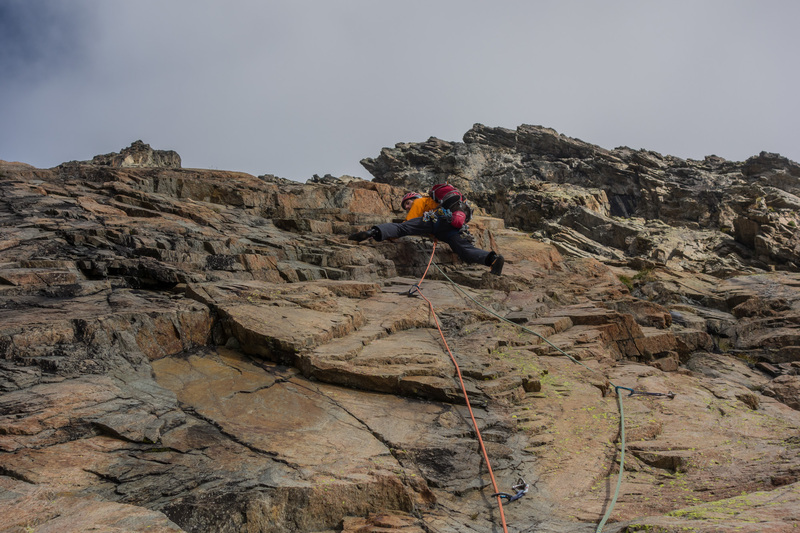 Debs and I were worried – Mark had spent the last four months re-habbing his left knee after an earlier injury, but now he had done his other one in. 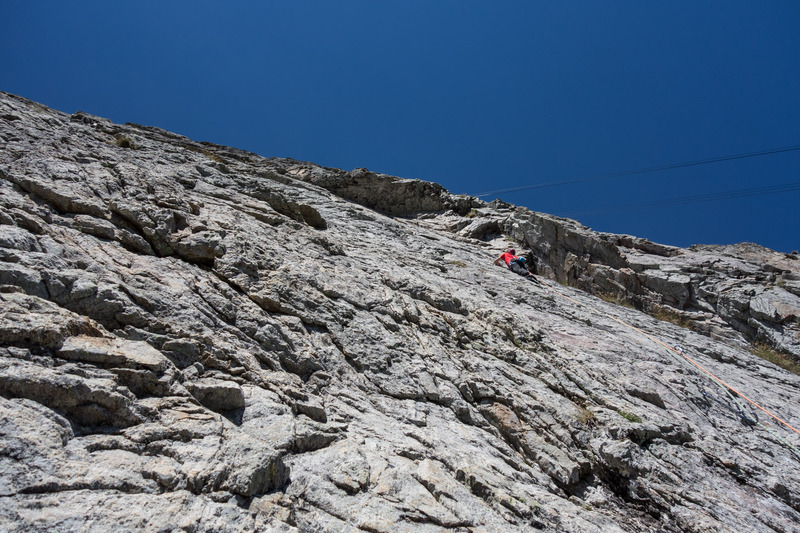 Mark somehow managed to get himself to the belay and Debs and I followed up anxiously. “I heard a loud pop and had the feeling of something unravelling” explained Mark with a grimace. There was nothing to do but head down. 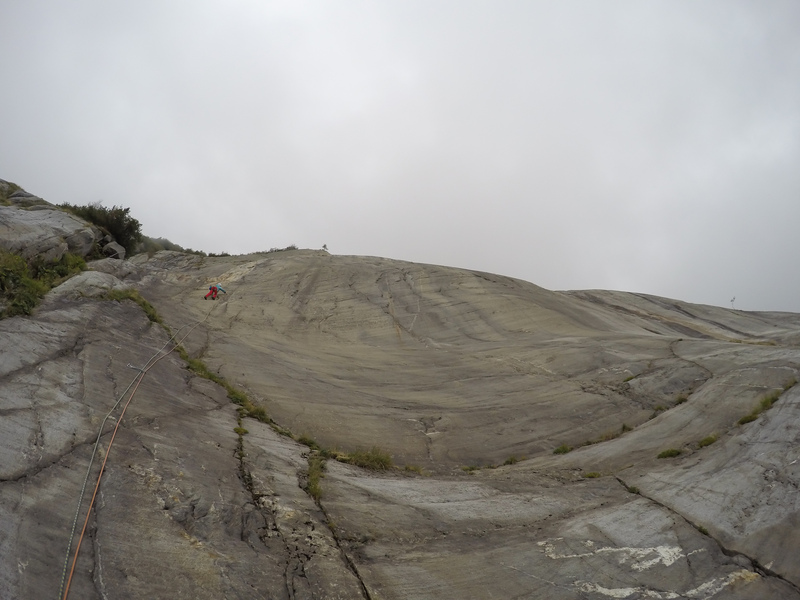 We abseiled off and hobbled back to the bivvy site for a rather cold and windy night. It later transpired that Mark had torn his meniscus cartilage and would need to be repatriated for an MRI scan and subsequent operation as soon as possible. The weather now turned for the worse and the next day we watched the rain fall as Mark arranged hospital appointments and battled with the logistics of getting home earlier than planned. 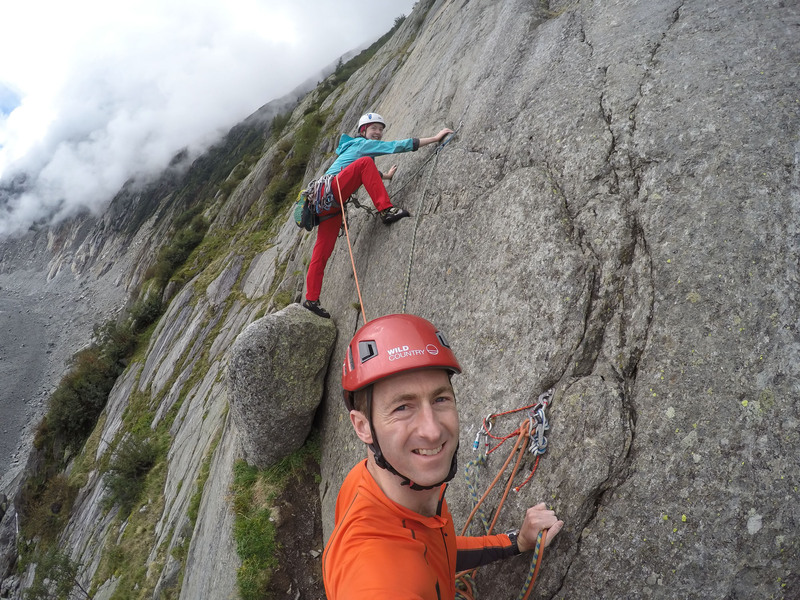 The following day saw Mark still glued to the phone and Debs and I ride the Montenvers train up in to the clouds, hoping the slabs would be dry enough for a couple of routes. 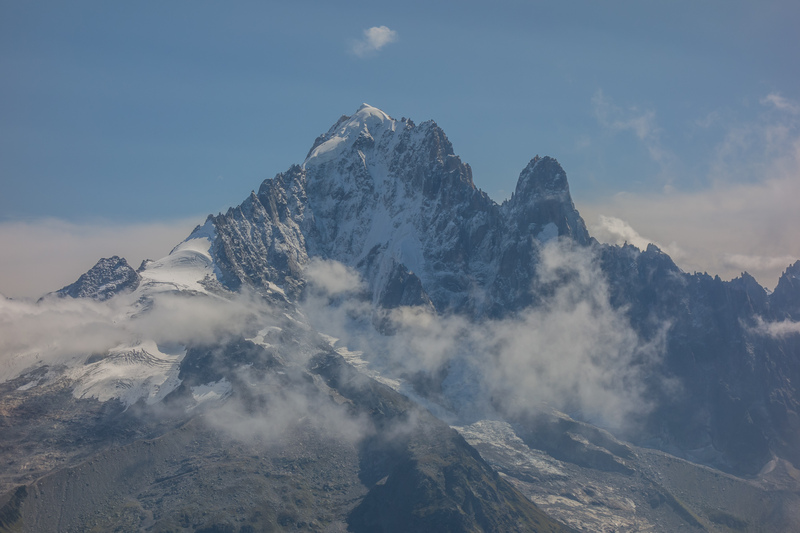 With temperatures plummeting, a chance of showers and thick cloud omnipresent, it looked like our chances of getting up into the higher hills were diminishing. The temperature in the valley had fallen by nearly twenty degrees centigrade in 48 hours! Almost reluctantly we once again rode the lift back up to the Index for an easy route that we hoped we could be quick on. In cold, damp clag we scampered up (the really quite nice) Mani Puliti, then shot straight back down for coffee and patisserie! 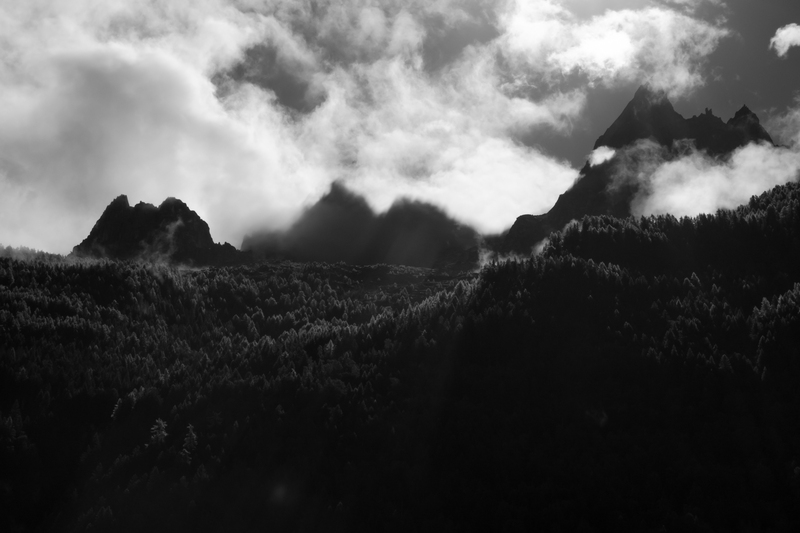 The Aiguille de L’Index emerges briefly from the clouds – spooky! 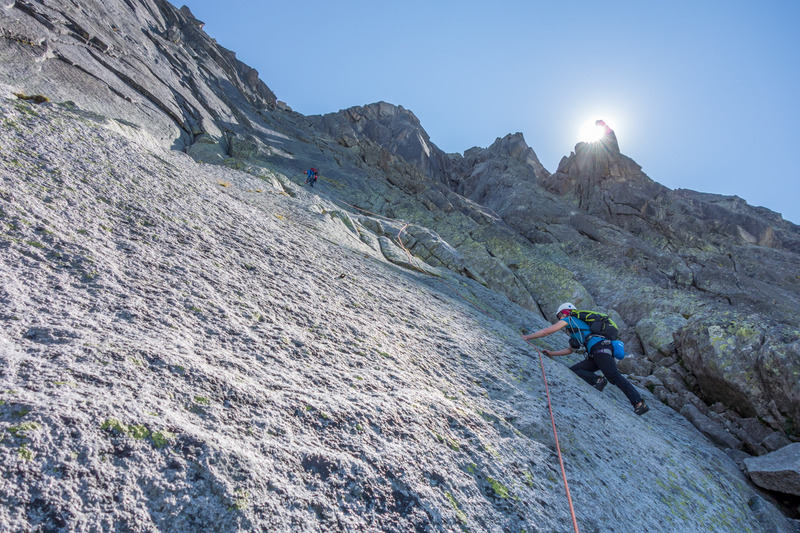 While still cold, the sun was at least forecast to show it’s face the next day, so resigned to the fact that our best chance of getting a route done was in the Aiguille Rouge we thought we would try something a little harder and longer. 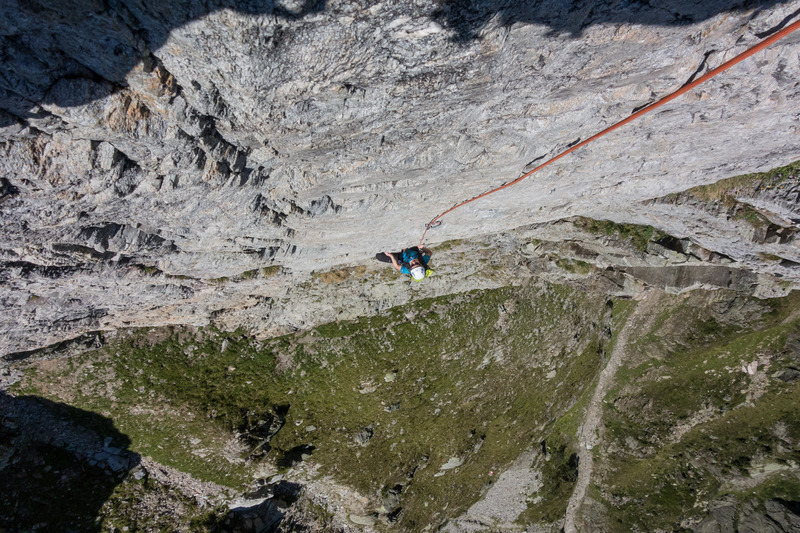 Manhattan on the Petite Floria had been on my list for a while and with it’s sustained central section flanked by easier pitches it seemed like a good bet! An alternative to the wet first pitch of Manhattan. Still bloody freezing though! So very much a trip of two halves – both in terms of the weather and unfortunately Mark’s presence. 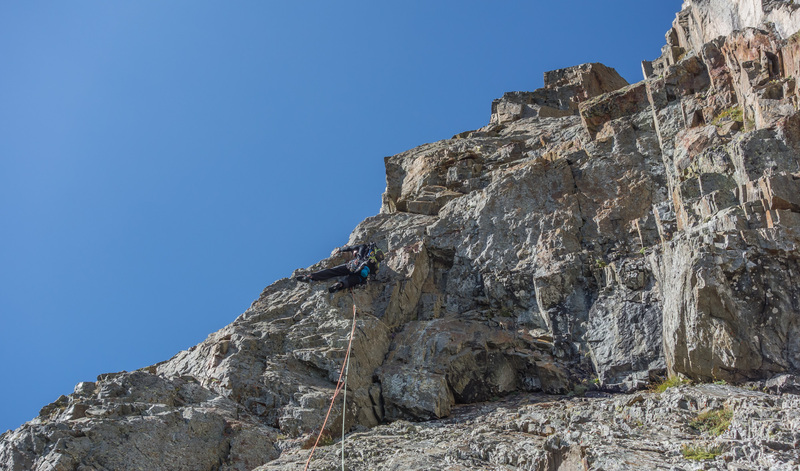 The hottest summer in recent years had reduced our options for classic high alpine routes dramatically and even snow down to 2000m wasn’t going to bring those routes back into condition over night. 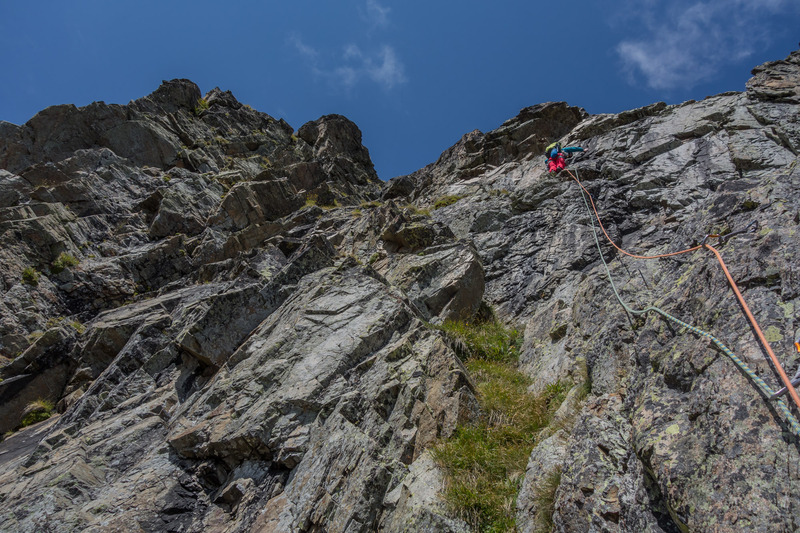 The one constant was the quality rock climbing, and while we didn’t experience the variety of routes we usually do it was still a great trip and welcome antidote to the wet and miserable Scottish summer! 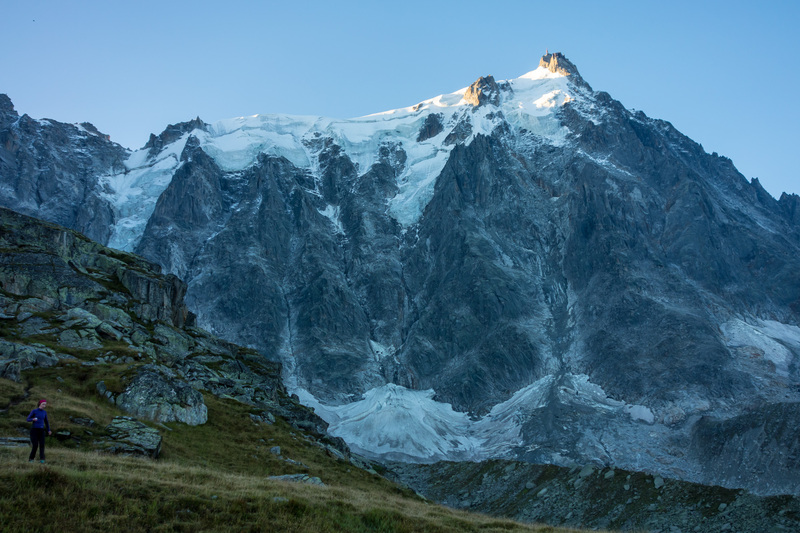 No set of photos from Chamonix is complete without one of the stunning Aiguille Verte and Aiguille du Dru – maybe next year!